The move marks the latest step in Disney’s partnership with parents to inspire kids to lead healthier lifestyles. 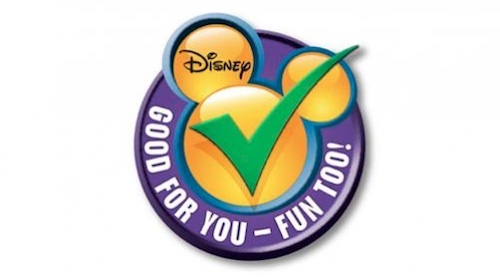 Under Disney’s new standards, all food and beverage products advertised, sponsored, or promoted on Disney Channel, Disney XD, Disney Junior, Radio Disney, and Disney-owned online destinations oriented to families with younger children will be required by 2015 to meet Disney’s nutrition guidelines. The nutrition guidelines are aligned to federal standards, promote fruit and vegetable consumption and call for limiting calories and reducing saturated fat, sodium, and sugar. We’re proud of the impact we’ve had over the last six years. We’ve taken steps across our company to support better choices for families, and now we’re taking the next important step forward by setting new food advertising standards for kids. The emotional connection kids have to our characters and stories gives us a unique opportunity to continue to inspire and encourage them to lead healthier lives. In addition to the new advertising standards, Disney introduced the “Mickey Check” tool, an icon that helps kids and families eat healthier by calling out nutritious food and menu items sold in stores, online, and at restaurants and food venues at its U.S. Parks and Resorts. By the end of 2012 the “Mickey Check” will appear on licensed foods products, on qualified recipes on Disney.com and Family.com, and on menus and select products at Disney’s Parks and Resorts. The Walt Disney Company Sets New Standards for Food Advertising to Kids. The Walt Disney Company. 2012 Jun 4.